Morocco currently offers the chance to enter in an exotic charming atmosphere, while experiencing an unique comfort and refinement. In an exclusive and tailor-made trip, one that goes beyond the usual touristic routes to paradisiacal places with all the comfort, you will have a set of activities to choose from and various experiences that will make this trip unique and unforgettable. Let yourself be involved in the Moroccan cities, which you can explore with the private collaboration of an historical guide dedicated only to each of the cities, whom will present their secrets in a way that only someone who truly studied the city knows. The imperial cities of Morocco are full of history, life and secrets to explore. 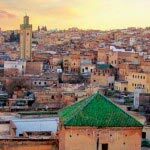 On this tour you will be able to visit the labyrinthine city of Fes, the cosmopolitan and always amazing city of Marrakesh, as well as Meknes, a city that had its pinnacle in the XVIII century. You will get to know Rabat as well, the capital of Morocco and Casablanca, where you can visit the monumental mosque of Hassan II. The historical and cultural visit of Morocco would not be complete without a visit to the Roman ruins of Volubilis, the empire’s most important city in North Africa. For those who want a more complete trip, you can also enjoy the delights and sumptuousness of the Atlas mountains, and explore the highest quality sites on the Moroccan coast with idyllic private beaches and delicious cuisine. Atlantic Cost, with unique gastronomy and private beaches. Visits on this day depend on the time of arrival in the city and can be made the next day. To start the tour we will go to one of the major wonders in Morocco: the Hassan II Mosque, the second highest mosque in the world, and a rare example of mosques that can be visited by non-Muslims. In the mosque, your guide will teach you about the religious traditions and rituals of the Muslim religion. In the words of the author of the book Morocco Country Study Guide, the Hassan II Mosque “undeniably marks the continuity of a modernized ancestral art and bears the sign of innovations that are due not only to technical reasons but also to a fertile exploration of new aesthetic possibilities”. After that, you can have some coffee and try the delicious traditional pastry in the park “de la ligue Arab”, the biggest park in the city of Casablanca, or have some soda by the sea. Take the opportunity to visit the famous Rick’s café, a piano bar created to recreate the ambience of the movie Casablanca . After the trip by plane, it may also be pleasant to walk outdoors through the corniche. Then we will leave for Rabat, a journey of only 45 minutes. Rabat is a city that grew in the fourteenth and fifteenth century, with the expulsion of the Andalusians from the Iberian peninsula. It is surrounded by three walls corresponding to the most remarkable phases of its history: the Almohad wall, the Andalusian wall and the Alawite wall. Visit the Capital of Morocco with a guide dedicated only to this city. You will be able to know the three medinas (medieval cities) of this beautiful and open city. Your guide will show you the ramparts and the main points of the city, such as the Hassan tower or the tomb of Mohammed V, and will give giving an historical perspective of the city. This city is open and modern, yet still has Moroccan charm and way of life. Not to be missed are the city’s famous pastries and the contemporary art museum Mohammed VI, where you can find the most famous pieces of Moroccan artists of the present / recent past. For dinner, you can experience a delicate fusion between high-end European gastronomy and Moroccan cuisine in an irresistible garden restaurant, where peacocks parade through the bougainvillea. For fish and shellfish lovers, there are also good options in Rabat. Alternatively, you can also enjoy a restaurant that stands out for the banquet atmosphere in a building that is an Andalusian style palace from the 18th century located in the heart of the medina, where several musicians play traditional live songs. The food is simple but diverse, and you can enjoy the most typical dishes of Morocco. We leave in the morning to the imperial city of Meknes, where you can visit the city with the company of an experienced historical guide. In Meknes, visit the Dar Jamai museum, a Moroccan museum of modern art including painting, jewelry, pottery and tapestry. The museum is housed in an old palace that includes a mosque, a hammam and outdoor gardens. Then you can visit a 14th-century Muslim religious school and also the legacy of AlMoravids, an important dynasty of the twelfth century, present in Meknes. You can also go for a stroll through the city. Near Meknes, in a private farm, you can also taste the best wines produced in Morocco (prior booking is required). With qualities similar to Bordeaux wines, Meknes wine is sweeter and more mature than the French due to the region’s climate. This area is the only one in Morocco that is DOC (Protected designation of origin) for the production of wines in Morocco. You can spend the afternoon in this beautiful farmhouse, while sampling various wines or enjoying them during a picnic. Alternatively, you can visit Volubilis, an archaeological complex of ruins of a Roman city, a site which is in the list of UNESCO World Heritage of Humanity in 1997. Internationally, it was known when Martin Scorsese filmed “The Last Temptation of Christ” here in 1988. Volubilis was the most important city of the Roman Empire in North Africa outside Egypt. It was the administrative center of the Maghreb and is today one of the best preserved ruins of classical antiquity. One can explore Volubilis with a guide to give an introduction of the history of this place. The ruins have well preserved beautiful mosaics that explain Roman mythology. After arriving in Fes you can take a panoramic tour before enjoying the view of the city from the top of one of the beautiful cafés of this city. We will spend the morning and part of the afternoon visiting medina de Fes, described by Paul Bowles as “an enchanted labyrinth protected from time”. You will be assigned an extra guide who is thoroughly familiar with this city, so that you can discover it deeply: its corners, traditions, stories and history. You will be able to visit the most important palaces, the Jewish quarters, the Madrassa (old school and university from the 13th century) and the Quoranic school. Furthermore, you will visit the authentic handicraft of Fes and its work of leathers. It is possible to buy original leather products very cheaply near the place of production, where ancient methods are still used. Discover unique restaurants within Morocco, whether for the diversity of dishes or for the magnificent views and ambiance. Try Café Clock, a pleasant spot with a terrace and panoramic views of the city with various activities such as Arabic calligraphy workshops, stories and narratives, cinema, among others. It has a very original menu, inside the traditional Moroccan food. For the connoisseurs of high end gastronomy, the restaurant “MB lounge” is recommended. Discover the middle Atlas, a magical forest, with a dreamlike native nature. We start the day by visiting the cedar forest and the monkeys that inhabit this region. This forest has many secret and wonderful places that are yet to be explored touristically. You will be able to see stunning landscapes through the natural park. In the middle atlas there are springs and waterfalls, flanked by small traditional Berber villages. There are several lakes where you can take a walk or enjoy a ride in a pedal boat. You can visit a farm that produces home-made cheeses, which you can taste as a snack, along with the organic honey produced here. For the more adventurous, there are marked and raked forest tracks for BTT and Quad (4×4 motorcycle). Enjoy your hotel in this paradisiacal place where you can enjoy various sports, and a SPA and Hammam are available. In the morning we will pass through Azrou, an important point in the middle Atlas. Then we head towards the desert. We will pass through the fertile valley of Ziz, one of the largest oases in the world and you can enjoy a panoramic view. Inside this forest of palm trees where the floor is covered with aromatic herbs and preserves all its authenticity. Next, we leave for Rissani. This city is known for its very beautiful entrance gate, the traditional weekly market and souk with plentiful crafts. This souk is open every day but is much more lively on Tuesdays, Thursdays and Sundays. Here we can try the traditional Berber pizza, a local specialty not to be missed. After breakfast, we continue the tour along the “Route of the thousand Kasbahs”. We will visit the Todra Gorges, where the cliffs reach 300m high, separated by only 15m. There is time to enjoy a stroll along the river, surrounded by the sumptuousness of this unique and rocky landscape. You will also meet Kalaat Mgouna – The City of Roses, where the surrounding landscape is complemented by the full aroma of the roses found in this valley. Then we will visit the oasis of Skoura, a green and fresh paradise, with one of the largest palm tree forests in Morocco. During the trip the golden sun in the faded mountains creates a scenery of western movie, ideal for those who like photography or mountain. Our adventure continues, following to Ouarzazate, the North African Hollywood where you will spend the night. In Ouarzazate we will visit an important cinema studio or alternatively a visit to the Kasbah of Taourirt. Ait Benhaddou is considered as a UNESCO World Heritage Site and it is the most important ksar in the “Route of the One Thousand Kasbahs”, a route of small fortifications that allowed the caravans of trade to travel between the Sahara Desert and the city of Marrakesh. It is still inhabited and it was used as setting, for movies, such as “Gladiator” and “Game of Thrones”, to add authenticity. We will arrive in Marrakech at the end of the day, being able to watch the shows that are there at this time in the main squares, and enjoy the bustling life of this city. During the day you will be accompanied by a touristic guide / historian exclusively dedicated to the city of Marrakesh, so that you can enjoy the best the city has to offer. At lunch, do not miss the chance to meet a cooperative of solidarity women, who cook delicious and harmonious dishes, combining exquisite flavoring with the freshness of natural products, locally planted. The food has a touch of home, and it is possible to participate in a Moroccan cuisine or pastry workshop. Koutoubia Mosque: Without any doubt this is the mostfamous and most photographed monument of Marrakesh. The Koutoubia Mosque was built on the 12th century and was a model to the Seville’s Giralda and Hassan’s Tower in Rabat. Ben Youssef Medersa: This Islamic faculty from the 12th century was ordered by the sultan Ali ibn Yusuf of Morocco. Today it is a museum that can be visited. The interiors are wonderful, all decorated and its architecture is exquisite. Bahia Palace: This incredible palace from the 19th century was extravagantly built to be the best of Marrakesh. It has an enormous garden, a central courtyard and several rooms amazingly decorated with works from artisans that purposely came to Marrakech from Fez to work. The day will end with dinner at the fantastic Jamaa el Fna square, where the mix of smells, music and spectacles are inspiring, and where tourists and locals often merge and dine side by side. Here you can experience the best of Moroccan street cuisine, among a variety of different sandwiches, teas. There are various stalls with a different specialty, and of course, the typical dishes, from Tagine to Couscous. All at Moroccan prices. There are several activities that can be done in Marrakech or near Marrakech, from hiking in the Atlas (40 minutes from Marrakesh), water sports such as water skiing, mountain biking, driving a 4×4 motorbike through the surrounding desert plains, and others. You may even have the unique experience of climbing to the skies in a hot air balloon and flying over Marrakesh and its palmeraie. You will have a privileged view of this ancient city as well as the Atlas mountains. You can also explore freely the city, always full of surprises and with lots of romantic nooks and crannies. There are open spaces such as the lush gardens of Majorelle, created by the painter Jacques Majorelle in 1931, later purchased by Yves Saint Laurent and Pierre Bergé, or sumptuous palaces with a fascinating decoration. Majorelle Gardens: This is the only botanical garden in Marrakesh. It was projected by Jacques Majorelle and it belongs to Yves Saint-Laurent and Bergé Pierre since 1980. Enjoy a walk surrounded by exotic plants from all over the world. Saadian Tombs: These tombs from the 16th century were ordered by Ahmad al-Mansur and in there were the bodies of around 60 members of the Saadian Dynasty originated from the valley of the Draa River, on the south. Curiously the tombs were only founded in 1917, being now one of the most visited monuments in Marrakesh. La Menara: This garden of Marrakesh is located 2 km away from the Jemaa el-Fna Square and it is the favorite place for all the Marrakchis to walk on a Sunday afternoon. These gardens were built in the 12th century, but the recent layout is from the 16th century. La Koubba almoravid: This rare almoravid building from the 12th century was ordered by Ali Ben Youssef from Morocco in 1106. You can visit the complex and see a water reservoir for cleaning before the prayer, with a impressive roof. For dinner you can try one of the many fine restaurants that are in Marrakech, with a dream environment in exclusive palaces that provide exquisite gourmet dishes. This day is dedicated to know the high Atlas. You will be able to get to know several stunning landscapes, of these mountains that are covered with snow in the winter, flowers in the spring, fruits in the summer, and reddish leaves in the autumn. Regardless of the time of a year, the high Atlas is always picturesque. There are several ways to spend an unforgettable day. You can visit a traditional Berber village and have lunch with a local family. Then visit the Tin Mal Mosque, a 12th century mosque replete with history and one of only two that can be visited in Morocco. You can also take a mountain hike with a mountain guide who knows the most beautiful trails of the Atlas. The hiking will go with a mule that will transport the material to cook lunch in the mountains.You can visit Lake Takerkoust and Kik Plateau with breathtaking scenery, or visit the Ourika Valley and the waterfalls of Setti Fatma. It takes an iron heart to resist the charms of the Atlas. Return to your hotel before the afternoon to enjoy the afternoon in this unique place, built by Sir Richard Brenson, as your refuge in Morocco. Enjoy your lounges, outdoor patios and gardens. Visit the artistic Essaouira, full of surprises, novelties and its unique gastronomy emphasizing on fresh fish and argan oil, a rich oil, similar to olive oil, but with a more toasty color and a palate to nuts, which makes the food more delicious. Essaouira is one of the most enchanting cities on the Moroccan coast and a multicultural arts center that has captivated people like Jimi Hendrix, Orson Welles and Bob Marley. With a fresh ocean breeze that is permanently invading all the corners of its medina, the city of Essaouira stands out by its urban life and culture. This coastal area, from the time that Carthage was an empire, has always been considered as one of the best anchor sites in the North African Atlantic. Essaouira’s Medina was built in the 18th century and it is one of the few in the world that had in facto an architectonic planning. It was by then that the city was given the name of Essaouira, which literally means “beautifully drawn”. The city is also the stage of the famous music festival Gnoa, an old spiritual art form of the North-African Islamism. Explore the coast of Morocco with its deserted beaches, fresh fish and delicious cuisine and genuine cities. Safi is a lovely coastal town. Although it has a castle and an old cathedral of the time of the Portuguese, it is best known for being the ceramic capital of Morocco. In Safi you can visit various ceramics manufacturing workshops, painting workshops and respective ovens. The National Ceramic Museum is housed in a huge building on one of the slopes of the city. Oualidia has the most beautiful beaches in Morocco, with a bay in the shape of a crescent moon, with golden sand dunes. The colors of the beach and surroundings shift with the time of the day, creating amazing scenic effects. One of the highlights of Oualidia is its oysters, considered the best in Morocco and one of the best in the world. You can leave by boat for a private picnic on a deserted beach, where you can visit the oyster bay of Oualidia. For wildlife lovers, you can go on a bird watching safari in this area. In the evening, enjoy a perfect sunset while tasting oysters with a glass of white wine by the lagoon. Enjoy your hotel’s Spa for an argan oil massage followed by a jacuzzi with sea water. Enjoy the morning in Oualidia. We continue to El Jadida. El Jadida is a small port city, formerly controlled by Portugal, which is now a UNESCO World Heritage Site. Formerly called Marzagão, this city has a Manueline cistern (built by the Portuguese in 1514 for storing water), one of its greatest attractions. You can also see the chapel of S. Sebastião and the façade of Our Lady of the Assumption Church, a Manueline style church whose façade has recently been recovered (but not inside the church). We continue to Casablanca where the tour ends. We bid you farewell after an unforgettable vacation. Camel ride in order to get to the camp. Extra activities such as hot air balloon rides, spa and hammam, wine tasting, etc.